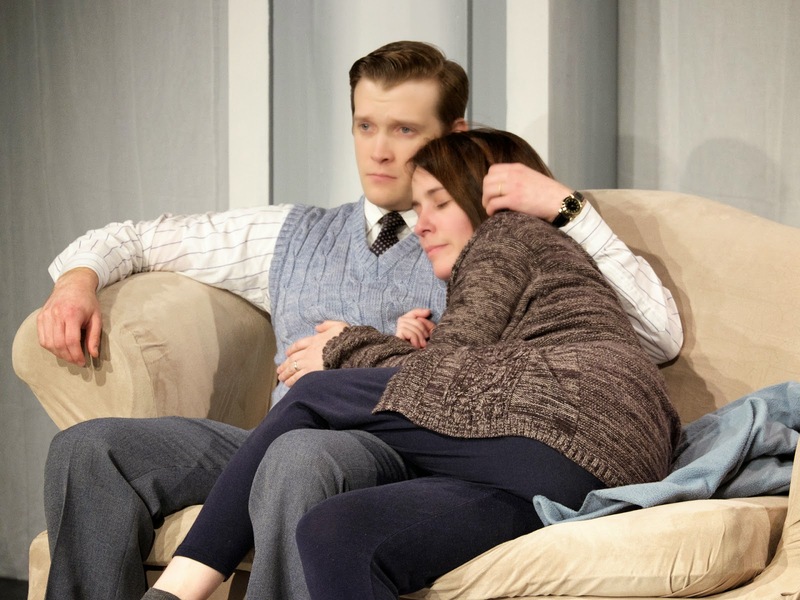 A NOSTALGIC VISIT TO "OUR TOWN"
If playwright Thornton Wilder was asked for an adage for life, he might reply "Don't postpone joy" or "Appreciate the little moments of life." In his iconic play "Our Town," he clearly states "You have to love life to have life and you need to have life to love life." In his moving soliliquey about three average, unremarkable days in Grover's Corners, New Hampshire, he makes a plea for valuing the simple joys of existence. Long Wharf Theatre in New Haven will be turning the clock back to the turn of the twentieth century to bring this classic play, the winner of a Pulitzer Prize for Drama, "Our Town," to nostalgic life until Sunday, November 2. We like to think of Thornton Wilder as a native son since he spent so many years here, living in Hamden, and is laid in perpetual rest in a Hamden cemetery. There is a universality to Grover's Corners that makes it Anytown USA and we readily identify with the doctor Frank Gibbs and his wife Julia and their children George and Rebecca and the Webb family, the newspaper editor Charles and his wife Myrtle and their children Emily and Wally. A budding romance develops between George (Rey Lucas) and Emily (Jenna Leona) as teenagers that is a delight to witness and progresses through marriage, a family and Emily's tragic death in childbirth. All along the way, the townspeople weave in and out of the action, as Howie Newsome (Jojo Gonzalez) and his cow Bessie deliver the milk, Dr. Gibbs (Don Sparks) delivers twins, Mrs Gibbs (Linda Powell) and Mrs. Webb (Christina Rouner) exchange gossip as they snap green beans and George and Emily grow up right before our eyes. Myra Lucretia Taylor is the beautifully eloquent narrator/stage manager who annotates our journey, offering tidbits of wisdom to make our odyssey more meaningful. Gordon Edelstein has chosen to cast the production wlth actors who have all previously trod the boards at Long Wharf, a diversified troupe, and even the graveyard has portraits of performers who are no longer with us but whose memories linger in our hearts and minds. Even if you've seen "Our town" before, this production is worthy of a second or twenty-second viewing. For tickets ($25-75), call Long Wharf Theatre, 222 Sargent Drive, New Haven at 203-787-4282 or online at www.longwharf.org. Performances are Tuesday at 7 p.m., Wednesday at 2 p.m. and 7 p.m., Thursday and Friday at 8 p.m., Saturday at 3 p.m. and 8 p.m. and Sunday at 2 p.m. and 7 p.m. On Sunday, October 26, playwright and professor Donald Margulies will speak after the 2 p.m. matinee about the timelessness and profound meaning of the play. Come help Long Wharf celebrate its 50th Anniversary with this favorite offering that brings home the message "notice the little things in life" for in the end it is the little things that matter the most. ENTER THE BIG TOP FOR "THE CIRCUS IN WINTER"
Have you ever just wanted to run away...to the circus? Would owning a circus be high on your to-do list? Author Cathy Day wrote a book, "The Circus in Winter," about her family and her hometown, Peru, Indiana, deemed the Circus Capitol of the World and the winter headquarters of the Hagenbeck-Wallace Circus. Her story cycle of eleven tales of the Big Top is being tumblesaulted into a brand new musical, of all things colorful and creative, and a strange and most intriguing tale it is. In her three decades of teaching, Beth Turcotte never imagined herself at the center of a three ring circus. An Associate Professor of Theatre and Dance Performance at Ball State University in Muncie, Indiana, she had always wanted to write a musical, but the opportunity never presented itself. In the spring of 2010, however, the universe aligned itself in a bizarrely wonderful configuration and Turcotte grabbed the brass ring and ran for the gold. Leading an immersive learning experience with fifteen undergraduates, Turcotte found herself with redheaded twins Christopher and Justin Swader who had talents in lighting design and big dreams of making a musical of "Hocus Pocus" as well as a music student Ben Clark who walked into class with a musical version of "Robocop." Clearly the class was ripe for a new musical adventure. This student driven production began with an exchange of ideas, looking for the perfect topic to forge into a musical show. In Turcotte's mind, "It takes a community to write a musical." That community effort began when some kids who had just finished reading "The Circus in Winter" for another class, suggested it for the launching pad. Virginia Ball had left funding for a faculty member to take a semester to complete a creative project. Cathy Day, the author of "The Circus in Winter," gave her enthusiastic approval and was available to help. She also provided her book material at no charge. Since then Broadway actress Sutton Foster and her brother writer Hunter Foster have provided invaluable advice and support. The Indiana Hoosier spirit took hold and the creative class was on a merry-go-round of imagination. Their initial desire to dedicate a piece to 9/11 and its impact on the Midwest morphed into the indomitable will and bravery of circus performers who face what's ahead with a strong attitude. The tale concerns Wallace Porter and three central characters who start off in different places and "collide" under the Big Top. Beth Turcotte calls this experience at the Norma Terris "the crown jewel, a magical place, a pie-in-the-sky fairyland," where it is allowed and encouraged to be "a work in progress up to the last performance." As for Turcotte, she's already on to her next big project: a new Musical Festival Theater at Ball State University where 139 submissions were received right out of the gate. The winner of a full production is a California entry about the creation of Lewis Carroll's "Alice in Wonderland" with a rock and roll theme. For tickets to "The Circus in Winter" ($45), call Goodspeed Musicals at 860-873-8668 or online at www.goodspeed.org. Performances are Wednesday at 2 p.m. and 7:30 p.m., Thursday at 7:30 p.m., Friday at 8 p.m., Saturday at 3 p.m. and 8 p.m. and Sunday at 2 p.m. and 6:30 p.m. at the Norma Terris Theatre, 33 North Main Street, Chester. Come take a seat under the big tent and discover a lonely circus owner Wallace Porter (Aaron Ramey), his wife Irene (Emily Behny). 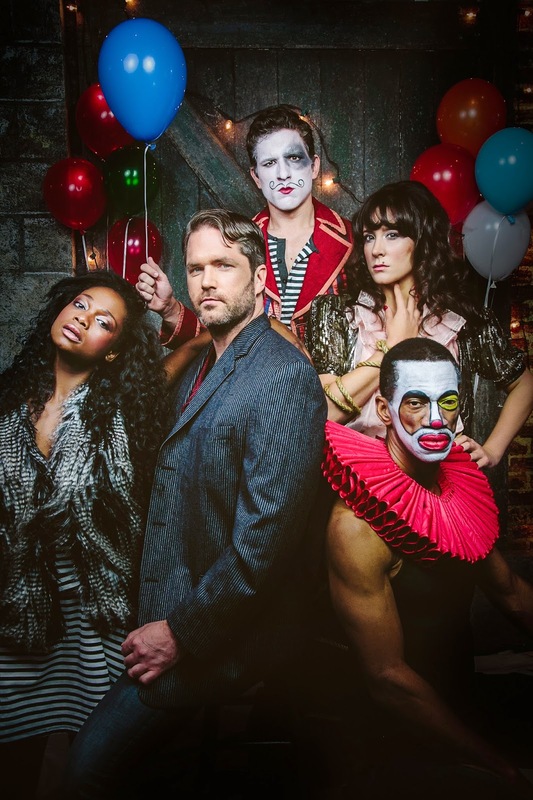 a death-defying acrobat Jennie Dixianna (Dee Roscioli), a sideshow African Queen Pearly (Shannon Antalan), assorted clowns like Ollie (James Penca) and even an elephant of enormous proportions. Bring your own bags of peanuts and Cracker Jacks. Revenge is a great motivator. Combine it with righteous indignation and the need to correct a grievous wrong and you have the relentless passion that consumes Hamlet, Prince of Denmark. His good father, the King, has been murdered, his life snuffed out by none other than his own flesh and blood, his brother Claudius. To compound this deadly deed, the new King, Claudius has within one month, a mere thirty days, taken Hamlet's mother, Queen Gertrude, his own brother's widow, to wed and assumed the heavy crown as ruler. You may think you know this dramatic tale by Shakespeare, but enter into the intriguing world painted by director Darko Tresnjak in the brilliant production of "Hamlet" currently being plotted at the Hartford Stage until Sunday, November 16.
treasonous deed and revealing the unfaithful heart of his mother, the Queen. Feigning madness, Hamlet seeks his revenge, holding his own counsel and swearing his closest friends to secrecy. To say his loving friend Ophelia (Brittany Vicars) is confused by his words and acts is an understatement. Her deep affection for Hamlet is tested to the point where she genuinely assumes a cloak of madness, especially after her father Polonius (Edward James Hyland) is slain by Hamlet's hand. 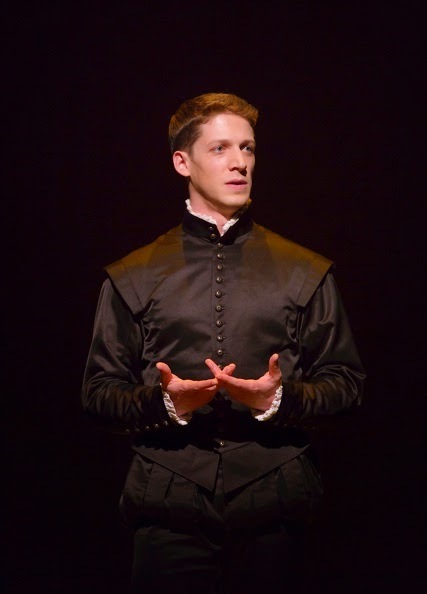 The absence of her brother Laertes (Anthony Roach) only compounds her grief. Hamlet's disdain for his mother Gertrude (Kate Forbes) is evident in his every word and gesture. As for Hamlet's uncle, now his step-father, Hamlet can't wait to catch him in a lie and even has a troupe of theatrical players perform a show that reveals his treachery and evil. Swept into the devious plot, his seeming comrades Rosencrantz (Curtis Billings) and Guildenstern (Cliff Miller) are revealed to be disloyal, while his good friend Horatio (James Seol) remains steadfast in his trust. The set designed by Darko Tresnjak is a giant cross, that gives note to the religious references of the tragedy and changes colors to match the action. The elaborate costumes by Fabio Toblini are an exquisite addition. Follow the ghost of Hamlet's father (Andrew Long) as he appears in a swirl of fog and mist to guide his son to the brink of danger and death. Turn the hands on the grandfather clock back in time to the turn-of-the-twentieth century in America when the dicotomy between the poor and the wealthy, the desperate and the hopeful, the prejudiced and the privileged was most pronounced. The sweeping grandeur and poignancy of "Ragtime The Musical" will follow a trio of families as they struggle to achieve the American dream. This multi-award winning show by the composer/lyricist team of Stephen Flaherty and Lynn Ahrens and book by Terrence McNally is based on the distinguished novel by E. L. Doctorow. Torrington's grand Warner Theatre will be dedicating its Main Stage to this sweeping musical from Saturday, November 1 to Sunday, November 9. A parade of famous people like Harry Houdini (Meric Martin), Henry Ford (Jamie Murphy), Booker T. Washington (Jamal Ford-Bey), J. P. Morgan (George Murphy), Emma Goldman (Priscilla Squiers) and Sanford White (Lyle Ressler) march in and out of this histoirically relevant tale. The worlds of three vastly different families collide on America's divergent shores. We meet a wealthy Protestant clan who include Father (Pat Spaulding), Mother (Rebekah Derrick), Mother's Younger Brother (Ryan Pipke), Grandfather (Mark Pronovest) and the Little Boy Edgar (Trevor Rinaldi). They represent the sheltered white privileged, living in New Rochelle, New York, who have been spared the difficulties of life. Their existence is far removed from the African-American one headed by Coalhouse Walker, Jr. (John E. Carter) who plays Ragtime music in Harlem and has his heart fixed on Sarah (Gia Wright). At Ellis Island, we meet newly arrived Jewish immigrants from Eastern Europe, Tateh (Dan Porri) and his daughter (Kennedy Morris) who are praying for a better life in this land of plenty, hoping his silhouette art will bring them prosperity. Each family, in turn, experiences love and loss, joy and sorrow, violence and redemption as they struggle to hold on to a flag of justice. Inspiring and emotional songs move the story onward and upward as causes are adopted, lives are sacrifised, wishes are fulfilled. Ultimately the desire for hope and for the future is triumphant. Sharon A. Wilcox will direct this passionate portrait of turn-of-the-century life, with Musical Director Dan Koch providing the stirring songs. For tickets ($18-26), call the Warner Theatre, 68 Main Street, Torrington at 860-489-7180 or online at wwwarnertheatre.org. Performances are Saturday at 8 p.m., Sunday at 2 p.m and Friday at 8 p.m.
Come let the Warner Stage Company with a cast of 64 bring to life this monumental musical guaranteed to inspire patriotism as its stirs your heartstrings. Dorothy and Toto have skipped along the Yellow Brick Road all the way from Kansas to the Land of Oz. Their adventures with the Scarecrow (Jimmy Johansmeyer), the Tin Man (Justin Rugg) and the Lion (Andrea Pane) are legendary. But now our spunky heroine is back among the corn fields with her Auntie Em (George Spelvin) and her Uncle Henry (Jimmy Johansmeyer) and she is bored, bored, bored. But not for long! 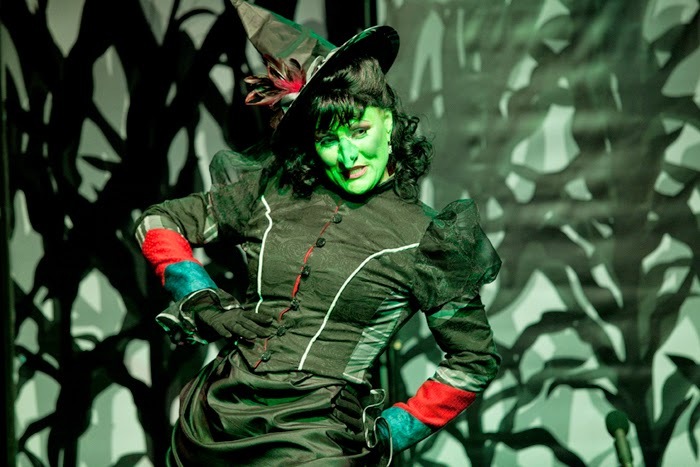 Follow the magical road of yellow bricks, courtesy of master map makers Pantochino Productions to their delightfully entertaining spoof "The Wicked Witch of the West Kansas or Bust!" playing weekends until Sunday, November 2 at the Milford Center for the Arts, 40 Railroad Avenue, Milford. Think green and mean and before you can say "Munchkins" three times who should appear but that scary madame of malice The Wicked Witch of the West, wonderfully captured by Shelley Marsh Poggio. She has a specific agenda: to get back her magical powers, her broom and her ravishing ruby slippers. To accomplish this, she must, at all costs and comedy, find Dorothy who stole them away from her, right under her pickled green nose. Dorothy is portrayed by the adorable pigtailed sweetheart, Mary Mannix, who is plum full of spirit and perkiness. 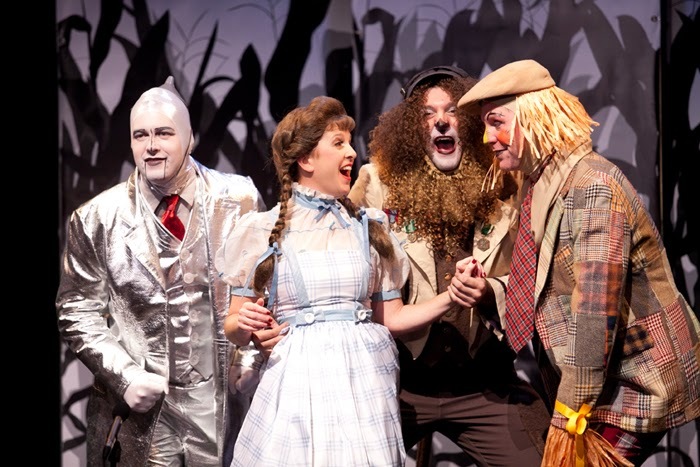 With her trio of hearty and trusted cohorts, the Lion, the Scarecrow and the Tin Man, they all set off to find the mysterious Wizard of Oz, another characterization assumed by the versatile George Spelvin. It's rumored that the Wizard is in possession of all the good stuff. That road of yellow is getting mighty crowded as the ragged Vagabelle kids, Elrod (Matthew Ranilla), Faylene (Hazel Foley) and Billy Jay Ray (Jay Maroney) are also on the trail of the treasure. And don't forget that big green lady who's determined to get all her goodies back. Thankfully Dorothy remembers to ask for help from her friend from her last giant adventure and the Good Witch Glinda (Rachael Dugas) flies in with a little comforting advice. Bert Bernardi has outdone himself in the clever department as this show is filled to the top of the corn fields with genuine humor (most of it corny). Justin Rugg's music, like the Wicked Witch's "I'm Back with a Vengeance," adds a delightful liveliness to the action. Jimmy Johansmeyer's costumes are a Halloween hoot. For tickets ($18 online, $20 at the door), go to www.pantochino.com. Performances are Saturday at 2 p.m. and 5:30 p.m. and Sunday at 2 p.m.
Polish your crystal ball, practice your cackles, look for rainbows and bluebirds and bring a big glass of water for you-know-who! STOP THE PRESSES FOR "NEWSIES"
" Hear ye. Hear ye. Extra. Extra. Read all about it" might be the rallying cry of newspaper boys all the way back to colonial times. They are the energetic, paper-in-your-face kids ready to earn a penny or two hawking the latest headlines of the day, scrapping by on the pittance they earn from the big publishing giants like Joseph Pulitzer and William Randolph Hearst. Hold on to your reading glasses and run as fast as you can to Waterbury's Palace Theater tonight through Saturday, October 25 as "Disney's Newsies The Musical" flies into town. 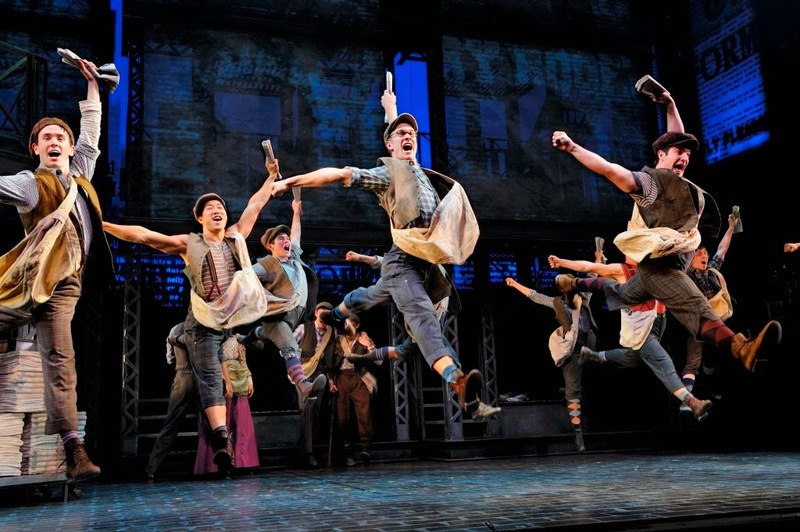 With book by Harvey Fierstein, music by Alan Menken and lyrics by Jack Feldman, "Newsies" has been making its own headlines, winning Tony Awards in 2012 for Best Choreography and Best Original Score. Based on a real newsboy strike in New York City in 1899, it centered on child labor practices, when the kids united to change the way the big powers compensated them. In the two weeks the boys refused to sell newspapers, circulation dropped from 360,000 to 125,000 and the kids were victorious in having their voices heard. Now you're invited to get in on the exuberant musical and dancing action as newspaper boys called "newsies" take to the streets to sell their wares. Often homeless and orphaned, they were not employees of the publisher. They couldn't return unsold goods. Working from early morning often to late in the night, they typically earned 30 cents a day. Come meet Jack Kelly, an enthusiastic hard working Dan DeLuca, who rallies his gang when he realizes the cost of the papers from the publisher has been raised. Jack gathers his force to protest and finds unexpected support from a reporter Katherine (Stephanie Styles). With the help of Davey (Jacob Kemp) who is helping the family when his dad is disabled, the boys are encouraged to "Seize the Day." The police and strikebreakers try to snuff their spirit but, ultimately, Jack's championing of their cause prevails and Pulitzer (Steve Blanchard) backs down on his monetary demands. Even Governor Theodore Roosevelt rides in to help save the day. For tickets ($30-70), call the Palace Theater, 100 East Main Street, Waterbury at 203-346-2000 or online at www.palacetheaterct.com Performances are tonight at 7:30 p.m., Friday at 8 p.m. and Saturday at 2 p.m. and 8 p.m.
Help Jack and his pals carry the banner of truth, justice and the American way as they hit the streets of 1899 New York City to battle the giants and win the day. TAKE A CLIMB UP "ANNAPURNA"
Life in a trailer park of accidental nudists is complicated. Just ask the cowboy poet Ulysses who has sought refuge in the mountains of Colorado after his wife Emma stole away one night with their son Sam, never to be heard from again. That was twenty years ago and a lot of snow and ice have frozen over their initial love and caring. Now, without warning or explanation, Emma is at Ulysses' trailer door. Why? What good reason could she have? Sharr White has penned an intriguing premise in "Annapurna," letting it all hang out at TheaterWorks of Hartford until Sunday, November 9. In Ulysses, he has created a character who has given up climbing any personal mountains. He's lost his wife and son years ago and doesn't remember why and now his health has deserted him, with death seemingly imminent. With no danger of winning a Betty Crocker or Martha Stewart Award for cleanliness or gourmet food preparation, Vasili Bogazianos' Ulysses has thrown in the dirty crying towel on life. The only things that keep him going are his slightly crazy incessantly barking dog and his active hatred of his trailer park's director Marty McNeely. With his life already in the crapper, he is still astonished to find Emma at his door, ready to move in, once the debris has been shoveled out. Debra Jo Rupp's Emma is in take charge mode and doesn't care that Ulysses doesn't want her, her bottle of Lysol or her cheese and anchovy sandwiches. It's a long trek up a dangerous mountain, alluding to the Nepal mountain noted in the play's title, but accusations and confrontations reveal the circumstances surrounding Emma's abrupt departure. The resolutions are amazingly quick and satisfying when they come, like a slide down a cliff, thanks to the perfect timing of director Rob Ruggiero. For tickets ($50-65, senior matinees $35), call TheaterWorks, 233 Pearl Street, Hartford at 860-527-7838 or online at www.theaterworkshartford.org. Performances are Tuesday, Wednesday and Thursday at 7:30 p.m., Friday and Saturday at 8 p.m. and Saturday and Sunday matinees at 2:30 p.m Come early to see a display of sculpture by artist Susan Clinard in the gallery upstairs, sponsored by The Hartford Financial Services Group. Clear off a space in a corner of Ulysses' messy home, designed by Evan Adamson, complete with ants, so you have an up close and personal view of what love, loss and reconciliation look like and learn what he has been doing with himself for the last two decades. The White Rabbit disappeared down a hole and Alice went through the looking glass to great and mysterious effect. For Professor Constance Ledbelly, her adventures began when her studies and research into plays by Shakespeare take her back in time to visit the likes of Othello, Desdemona and Iago and later to Romeo, Juliet, Tybalt and Mercutio. Enter the intoxicatingly complex world where a young English literature professor from across the pond ventures into worlds far away from her everyday existence. She lands right in middle of two of Shakespeare's greatest tragedies: "Othello" and "Romeo and Juliet." The Department of Theatre on the campus of Central Connecticut State University, 1615 Standly Street, New Britain will be stretching the boundaries of imagination until Saturday, October 18 at 7:30 p.m. in the Mahoney Black Box Theatre with its production of "Goodnight Desdemona (Good Morning Juliet)" by Ann-Marie MacDonald. Benideliz Canales Salgado plays the intrepid Constance who theorizes, after extensive research, that evidence exists that these two plays in question were originally comedies, written by a mysterious "fool." Whether in her subconscious or by sleight of hand and some hocus pocus, Constance finds herself suddenly immersed in Shakespeare's world. Throwing on a figurative cloak of courage, she encounters easily persuaded Othello (Laugh Sanchez), the conniving Iago (Stephen Lenczewski) and the innocent Desdemona (Kat Barone). Constance soon finds herself fighting duels and saving lives. She intervenes and interferes in the story of Romeo (Matt Cote), Tybalt (Anthony Yovina), Mercutio (Kat Blair), Juliet (Melanie Gawlak) and her nurse (Adam Cormier), changing the course of events along the way. Who knew penning a doctoral dissertation could be so dangerous! Mistaken identities ensue, swords clash brilliantly, pillows are used to smother, handkerchiefs with strawberries signal infidelity and strange sexual attractions abound. Thom Delventhal directs this comedy or errors and tragedy of intentions with an ambitious all student cast. For tickets ($10 students, $5 seniors), call the box office at 860-832-1989 or online at theatre.ccsu.edu. Next up will be "It's a Wonderful Life" by Joe Landry December 4-6 and "Servant of Two Masters" by Carlo Goldoni March 3-7. 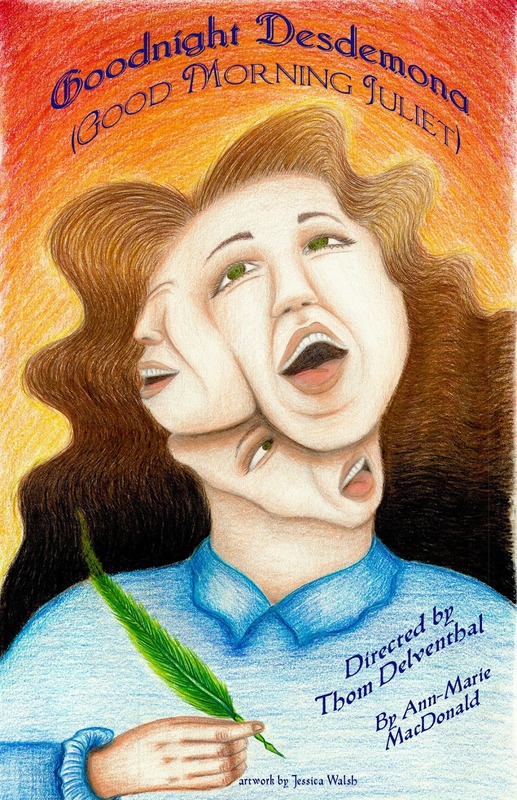 Help cheer on Constance and help her discover her true self as she plunges headlong down the Shakespearian rabbit hole. Esther Mills, at the turn of the twentieth century, has been working virtually around the clock to fashion a better life for herself. Fueled by a dream of owning an elegant beauty parlor catering to African-American women like herself, she has scrimped and saved every dollar she has earned stitching personal items, undergarments and dresses, for females. Her crazy quilt lining on her bed is the "bank" in which her future is stored. Sturdy and plain and now thirty-five in age, Esther has witnessed dozens of girls, from the rooming house of Mrs. Dickson where she resides, take the path to matrimony. Just when hope seems most elusive, she receives a letter, a love letter, from a Jamaican laborer George Armstrong working on the Panama Canal. Suddenly Esther's prospects for happiness begin to shine, like an early morning sun after a night of rain. 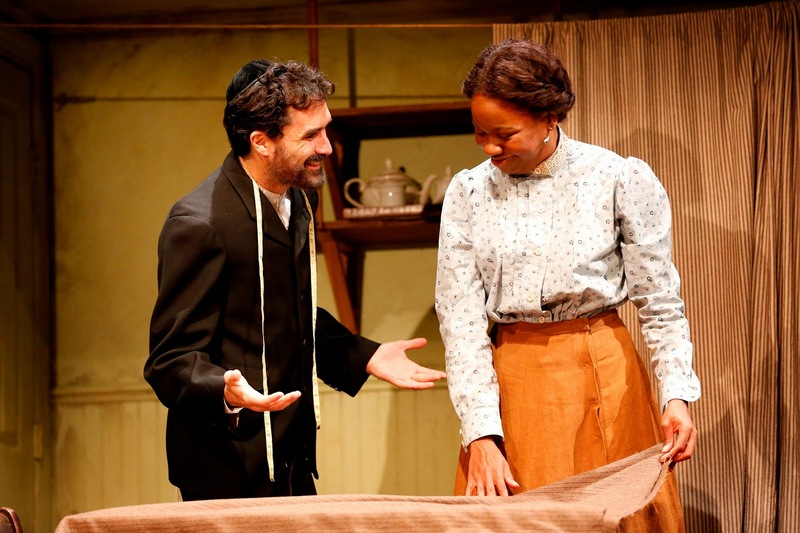 Lynn Nottage's "Intimate Apparel" will be beautifully hung on a clothesline for your inspection at Westport Country Playhouse until Saturday, November 1. Allen Moyer's layered set moves seamlessly from Esther's single boarding room to her friend Mayme's space where she entertains her paying make guests to the workshop of Mr. Marks, where Esther purchases her material to the home of Mrs. Van Buren, a wealthy white woman who employs her services. As a modest spinster, Esther (Nikki E. Walker) is intrigued when she receives a letter from the physical laborer George (Isaiah Johnson). She seeks the help of Mrs. Van Buren (Leighton Bryan) and even Mayme (Heather Alicia Simms) to help her write a reply since she can neither read nor write. Her land- lady Mrs. Dickson (Aleta Mitchell) doesn't approve of Esther's correspondence with a strange man, especially when she has prospects of her own closer to home to promote. The high points of Esther's week are her visits to Mr. Marks (Tommy Schrider), the Jewish shopkeeper who saves her the finest of his merchandise. The inappropriate feelings they have for each other are not allowed to grow or flourish. Esther's choices, although made with a true and loving heart, bring her heartbreak but do not destroy her worthy soul. Mary B. Robinson directs a story of sensitivity and sorrow, longing and love that will long resonate in your memory. For tickets ($30 and up), call Westport Country Playhouse, 25 Powers Court, Westport at 203-227-4177 or 888-927-7529 or online at www.westportplayhouse.org. Performances are Tuesday at 8 p.m., Wednesday at 2 p.m. and 8 p.m.,Thursday and Friday at 8 p.m., Saturday at 3 p.m. and 8 p.m., and Sunday at 3 p.m. Stand up with Esther as she balances triumph and tragedy in a life that is both blessed and cursed. Being the favorite son is not all that great if you are one of twelve brothers and sibling rivalry and the green eyed goddess named jealousy are evident in every interaction of the family. You might even find yourself cast into a pit or sold off to a caravan bound for Egypt, especially if your name is Joseph, a special son of Israel. You may find that your father Jacob is powerless to protect you from the machinations of your brothers, if you incite their anger by boasting of dreams where your superiority is evident. When Jacob gives Joseph a beautiful rainbow-hued coat of glorious colors, Joseph's fate is sealed. This wonderful story from the Bible will be brought to magnificent life at the Bushnell Center for the Performing Arts when Andrew Lloyd Webber and Tim Rice's great family musical "Joseph and the Amazing Technicolor Dreamcoat" comes to Hartford from Tuesday, October 14 to Sunday, October 19. This show, believe it or not, was penned by the pair while they were still teenagers and it has thrilled millions with its unique story of jealousy, envy and redemption. Initially, in the summer of 1967, Lloyd Webber was asked to write a "pop cantata" for a school concert at Easter time. Who culd have predicted the glorious road that request would take. Follow the clan as Joseph travels from the ancient land of Canaan to the mysterious environs of Egypt, traveling to the musically diverse genres from calypso and country western to rock and roll, and even ballads with a distinctly French flair. Husband and wife team Diane De Garmo and Ace Young will star, with De Garmo as the engaging Narrator who tells the tale and Young as the charming but betrayed Joseph who is sold into exile. His adventures take him to the household of Potipher (William Thomas Evans), whose wife causes Joseph further troubles, landing him in jail. While imprisoned, Joseph is asked to interpret the dreams of a baker and a butler. His skills as a revealor of nighttime thoughts lead him to be summoned by the mighty head ruler of the land, the Pharaoh, who wants Joseph to tell him what his dreams foretell. Joseph, due to his talents for organization, helps the Pharaoh (Ryan Williams) stave off a famine that has the power to devastate the land. In his position as the Number 2 man in command, Joseph ultimately has the satisfaction of witnessing his brothers bow down to him as he had predicted, even though they do not recognize him. Andy Blankenbuehler does double duty as the director and choreographer of this infectious feast for the eyes and ears. Songs like "Any Dream Will Do," "Close Every Door" and "Those Canaan Days" are simply wonderful. For tickets ($21-80), call the Bushnell, 166 Capitol Avenue, Hartford at 860-987-5900 or online at www.bushnell.org. Performances are Tuesday, Wednesday and Thursday at 7:30 p.m., Friday at 8 p.m, Saturday at 2 p.m and 8 p.m and Sunday at 1 p.m. and 6:30 p.m. Follow the journey of Joseph, Jacob's favored son, who is singled out for greatness but endures many trials before his true fate is realized. ENTER THE ENCHANTING WORLD OF "ARCADIA"
Playwright Tom Stoppard proves his intelligence and wit in every word of his challenging and involving masterwork "Arcadia" that probes such diverse topics as chaos and order, jam in rice pudding, mathematical equations, the meanings of "carnal embraces,"
literary criticism and the history of gardens, among many others. 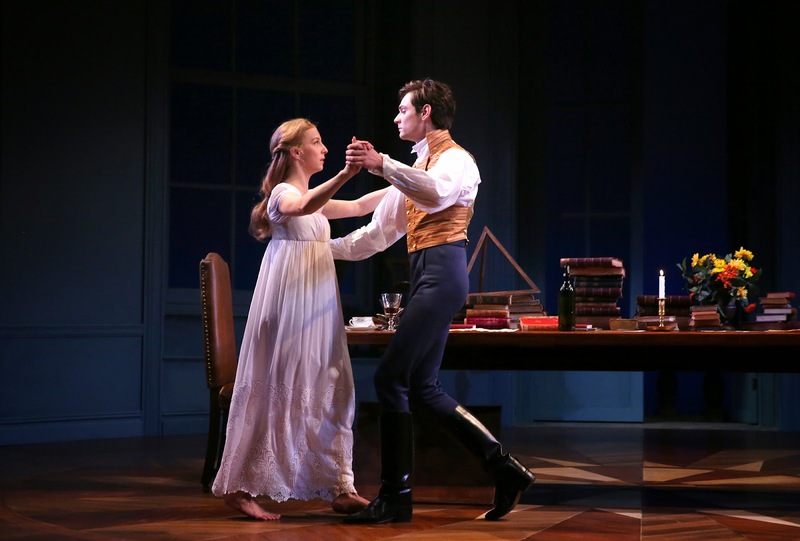 Yale Repertory Theatre in New Haven will be shining an orb of enlightenment on "Arcadia" until Saturday, October 25. The more erudite you are and well learned, the better to catch all the myriad historical and literary references. Even if you miss a goodly portion of them, you will still be enchanted by the banter in this multi-layered tale set in two different centuries hundreds of years apart, 1809 and circa 2009. Stoppard's intriguing story begins with a pert and precocious teenager Thomasina, delightfully captured by Rebekah Brockman, querying her tutor Septimus, an engaging Tom Pecinka, about "what is carnal embrace?" His explanation, that skirts the truth, sets off an exploration of knowledge that reveals proofs for theorems, mathematical laws, lessons in folly and all the gossip that keeps Sidley Park igniting on all sixteen cylinders. An illusive Lord Byron is never seen but his poetic influence is felt. The scholarly discourse surrounding Byron and what took place in 1809 consumes the minds of the educated lot who people Sidley Park two centuries later. Who is the hermit? Was a duel fought? What do the designs of the garden portend? What do Thomasina's equations mean involving the behavior of numbers? A reverence for learning is evident as well as a healthy spirit of discovery. In the current times, a scholar Bernard Nightinggale, portrayed by a tempest swirling Stephen Barker Turner, has invaded Sidley Park to gather research on a talk he is giving for the Lord Byron Society. His theories and allegations stir up a hornet's nest of controversy among the residents, Hannah (Rene Augesen), Chloe (Annelise Lawson), Valentine (Max Gordon Moore) and Gus (Bradley James Tejeda). Thomasina's world is also peopled by Ezra (Jonathan Spivey), Noakes (Julian Gamble), Lady Croom (Felicity Jones) and Captain Brice (Graham Rowat). Across the boards and across the centuries, the cast is uniformly excellent. James Bundy directs this three hour entertainment with a skilled hand, one that waltzes in perfect step. For tickets ($20-98), call the Yale Rep at 203-432-1234 or online at www.yalerep.org. Performances are at the University Theatre, 222 York Street, New Haven Tuesday at 8 p.m., Wednesday at 2 p.m. and 8 p.m., Thursday at 8 p.m., Friday at 8 p.m. and Saturday at 2 p.m. and 8 p.m. Follow the trail of clues from the past that confuse, elude and astonish the current generation. Be assured that no tortoises were harmed in the making of "Arcadia." 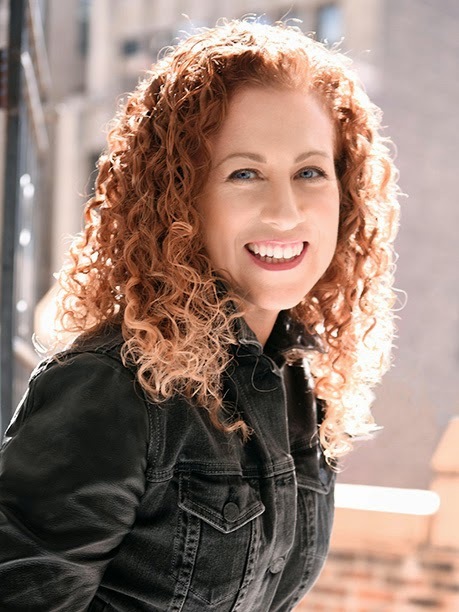 AUTHOR JODI PICOULT TO SPEAK OCTOBER 17 SACRED HEART UNIV. As supreme storytellers go, Jodi Picoult is at the top of her field, or in this case on the top of her elephant, sitting on a howdah, if she approved of such an act. As the author of twenty-two books, many of them best sellers, read to date by 25 million people in 35 countries, Picoult is a master at weaving involving tales about topics as diverse as stem cell research ("My Sister's Keeper"), the Holocaust ("The Storyteller"), Asperger's Syndrome ("House Rules"), wolves in their native habitat ("Lone Wolf") and school shootings ("Nineteen Minutes"). Her books are noted for their plot turns and twists, her ability to voice her characters with a true pitch, the extensive research she conducts to speak with authenticity and her ability to capture human experiences so beautifully and sensitively. Picoult will leave her New Hampshire farm where she lives with her husband and family and small menagerie of furry animals to speak on Friday, October 17 at 7 p.m. at Sacred Heart University, in the Edgerton Center for the Performing Arts, 5151 Park Avenue, Fairfield, courtesy of WSHU Public Radio. Picoult's newest novel "Leaving Time" is set in a game reserve for elephants in Botswana, telling the tale of Alice, a researcher who has devoted her life to studying memory in pachyderms. The natural caring and compassion a mother feels for a child is echoed in this animal, mother for her calf. When a helpless baby is orphaned, Alice feels the need to rescue it and guard its safety. "Leaving Time" will be released October 14 so the audience at Sacred Heart will be among the first to learn how Ms. Picoult selects her topics, researches them extensively and then writes an involving story that captures readers from page one. Elephants have been said to "never forget," and that despite not having good eyesight they never forget a face. This "recall power" is important in helping them survive, as mother elephants have been noted to retain a "store of social knowledge" when dealing with their family, their herd. Living up to 60 years, they are said to recognize themselves in a mirror, can "imprint" memories that are essential to their survival and can actually grieve at the loss of a member of their herd or of the trainer or keeper who was good to them. Did you know elephants use their ears as giant fans to cool themselves? That they don't drink with their trunks but use them to feed water into their mouths or that they have the largest brains, 10.5 pounds, of any animal? They even play a critical role in the environment. You'll know all that and more after hearing Jodi Picoult and reading her newest book. To get an in depth perspective on pachyderms and their intriguing bonding behavior, especially with humans, let Jodi Picoult be your animal guide. With this loyal and social beast of the wilderness, she will weave an intriguing story of a Alice and her daughter and how an enduring love can survive a devastating tragedy. Come to WSHU Public Radio's Join the Conversation. The event is $30 and includes a copy of the book, and students are $10, with no book. Join the Conversation is jointly sponsored by IKEA of New Haven, the Wyant Simboli Group and the Law Firm of Cohen and Wolf. For reservations, call 203-371-7908 or go online to www.edgertoncenter.org. Come hear Jodi Picoult, a master of storytelling since she penned her first book at age 5, "The Lobster Which Misunderstood." Playwright Tony Kushner has conjured up an amazing and colorful cast of characters in his 1993 Pulitzer Prize-winning drama "Angels in America: Millenium Approaches." This masterwork of epic proportions is being showcased at West Hartford's intimate and inventive Playhouse on Park until Sunday, October 19. Hold on to your seat cushion as a floatation device as you witness this mind blowing theatrical production where one moment the ghost of Ethel Rosenberg is chastising the McCarthy-era attorney Roy Cohn as he is dying and the next moment a Valium-popping Mormon wife is discovering that her husband is gay and she feels betrayed. The play takes place during the Reagan years, the 1980's, where AIDS and homosexuality are in the forefront. American society and its mores are examined under a microscope of cynicism, intolerance and judgment. Kushner takes his audience on voyages of discovery to Antarctica and Heaven as well as closer to home in San Francisco and New York. Biblical references abound, hallucinations are prevalent and angels and ghosts are ever-present. You may want to keep a scorecard to keep track of Prior Walter (James Parenti), a gay man with a long lineage as well as AIDS who may be a prophet and his boyfriend Louis (Marty Scanlon) who abandons him because he can't deal with Prior's dire diagnosis. Joe Pitt ( Tim Hackney) has tried to keep his sexual preferences a secret from his wife and from the world as he serves in the United States Appeals Court, while his wife Harper (Kristen Harlow) suffers from delusions due to her perpetual drugged state. Joe is a friend of Roy Cohn (Jim Shankman) who claims to be sick with liver cancer, rather than admit he has AIDS. Roy wants Joe to accept a new job in Washington where he can help Roy out of his legal troubles. When Roy is dying, Ethel Rosenberg (Rae C. Wright) comes to his bedside to blame him for her conviction and execution as a Communist spy. Adding to the intrigue are Joe's mother (Rae C. Wright), Belize ( Clark Beasley Jr.) a drag queen who helps Prior, Emily (Olivia Hoffman) a concerned nurse, Henry (Rae C. Wright) Roy Cohn's doctor who diagnoses his condition and many others including a Mr. Lies (Clark Beasley Jr.) a travel agent for Harper's hallucinations, an Eskimo (Tim Hackney ), a figment of Harper's imagination, a long dead grandmother Sarah (Rae C. Wright, again!) and a card playing Rabbi (also, Rae C. Wright). As you can see, many actors take on multiple roles in this drama that is extraordinary theater, engaging, emotionally exhausting for both the audience and the amazing players, who take on difficult and challenging roles with impressive skill and talent. The pace is fascinating, the words and relationships rewarding, the action absorbing, and according to many, the best written piece of American theater ever. Kudos to Sean Harris for his courage in selecting and directing this brilliant, involving and complex exploration into the consuming topics of the time. For tickets ($22.50-35.00), call Playhouse on Park, 244 Park Road, West Hartford at 860-523-5900, ext. 10 or online at www.playhouseonpark.org. Performances are Wednesday and Thursday at 7:30 p.m., Friday and Saturday at 8 p.m. and Sunday at 2 p.m.
Let Playhouse on Park guide you through the imaginative and unique mind of Tony Kushner for a three and a half hour afternoon or evening of theater that is haunting and heavenly all at the same time. For Frederico del Sagrado Corazon de Jesus Garcia Lorca, his life was creatively plentiful and his death was sudden and mysterious. Proclaimed to be "the nearest thing to a pure genius" by H. G. Wells and Rudyard Kipling, Frederico Garcia Lorca was known as a gifted poet, dramatist, painter, song writer and theater director in his native Spain. His unique story is being lyrically and dramatically staged on the campus of the University of Connecticut, 820 Bolton Road, at Storrs in the Nafe Katter Theatre until Sunday, October 12. 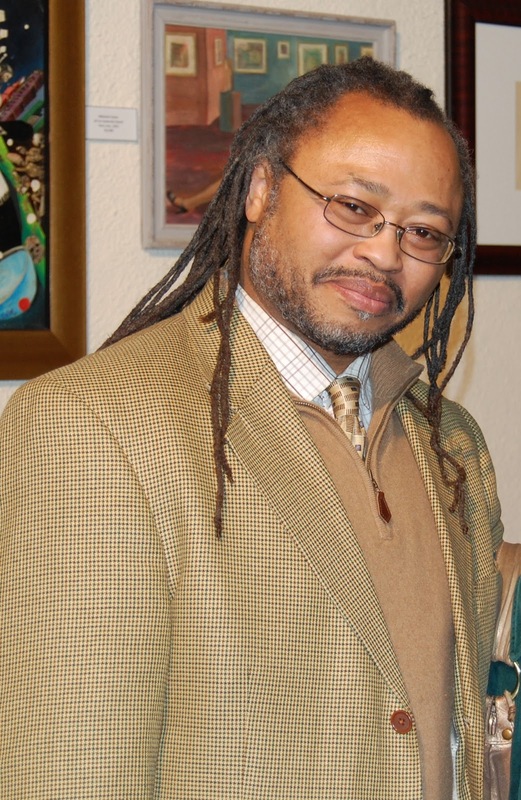 "Olives and Blood" is the masterwork of Associate Professor of Dramatic Arts and Director of the Theatre Studies BA at the University of Connecticut Michael Bradford. A decade ago Bradford became fascinated with the mystery surrounding Lorca's death during the Spanish Revolution in 1936, when Lorca suddenly disappeared. A poet himself, Bradford was researching material for a class and Lorca's distinctive voice intrigued him. In "Olives and Blood," Bradford creates dream sequences and hopscotches in time from the 1930's to the 1970's to capture the political climate in which Lorca worked and wrote juxtaposed to the life of the militia man Truscante who wants to proudly claim the distinction for taking Lorca's life. The drama stretches back and forth like an elastic band, first capturing the idealistic young poet beautifully delineated by Nicholas Urda, and then snapping sharply to the delusional Truscante, portrayed with a touch of malice and mischief by Martin Sola. A judicial tribunal is being convened in 1970 and Truscante can't wait to testify to his role in putting Lorca into a violent and early grave. His evil does not provoke any empathy. The role of censorship to silence Lorca's powerful voice booms from the grave, a voice of music and art, that still reverberates decades after his death. The brutality of the Spanish Civil War echoes with the demise of 130,000 in mass burial plots, bones on bones. Lorca's story embraces his relationship with his friend Ignacio the bullfighter (Anthony J. Goes), the actress Margarite (Anita Petry) and Alonso (Anthony J. Goes), the man who initially arrests him and wants him killed. Others in the cast include Dale AJ Rose, Gabriel Aprea, Whitney Andrews, Derrick Holmes, Saul Alvarez and Kent Coleman. Gary M. English directs this probing look at a poet and his legacy. For tickets ($7-37), call 860-486-2113 or online at www.crt.uconn.edu. Performances are Wednesday and Thursday at 7:30 p.m., Friday at 8 p.m., Saturday at 2 p.m and 8 p.m. and Sunday at 2 p.m. Discover for yourself that Lorca is not really dead. He is living through his words and his work, with his powerful voice wherever in the world his thoughts are spoken. If all is fair in love and war, add music to that mix and Tony White might just agree. A few years back, in the world of Nashville he calls home, he spied a pretty "real cool girl" who played a mean banjo with a bluegrass flavor and invited her "to strum and jam with me." With her banjo and mandolin, he knew he was on to "something good. I already had a crush on her." Her name was Grace and their paths crossed and contacted, his punk heavy metal band met her softer, gentler bluegrass and together they took their music in a different direction. Tony describes their sound as Punkgrass and you'll have the opportunity to hear this husband and wife duo and sample their uniqueness on Wednesday, October 8 at 7:30 p.m. at the Ballroom at the Outer Space, 295 Treadwell Street, Hamden. For tickets ($10-12), call 203-288-6400 or go online to www.theouterspace.net. Tony and Grace will be the opening act for Dom Flemons, who founded the Carolina Chocolate Drops and is known as an American songster. Flemons is a multi-instrumentalist and is likely to play guitar, banjo, harmonica, fife, bones and jug as he travels along a path of old time music, rhythm and blues, early jazz and some original tunes. With his vintage hat and strumming his 1920's banjo, he will project a sound that screams of its "old time roots." As for Tony and Grace, Tony describes Punkgrass as a combination of his punk rock background melding and merging with Grace's southern Gospel and bluegrass background. As a fusion of old and new, Tony brags "We play whatever pops into our heads, from classic rock to southern Gospel, we scratch every itch. It's dark, yet happy; silly, yet serious. Plus it's a whole lot of fun to play." Their new album "November" is termed "emotionally connective music," embracing "lyrical tales of murder, addiction and lost love wrapped up with a happy twist." To say dark themes intrigue Tony and Grace is an understatement and how they surround them with a Tootsie Roll covering of fun is just plain original. As for touring, Tony calls it "surreal. People care about us and overwhelm us with kindness. It's great to perform with Grace. It's funny. She's always nervous before a show, no matter the size or venue. I'm not nervous but I'm not good under pressure, whereas she is. She's a rock and always on her mark, and somehow together we work, our vibrations hit." Their fourteen city tour will take them through the Midwest and Northeast. Between gigs, they spend a lot of time in the car, riding, where they work on the band and the business, almost 24/7. As for working with Dom Flemons, that's "wonderful. He's a Grammy Award winning solo artist who is so talented and we are floored by him. We hang on to every breathe." Tony and Grace have nothing to be apologetic about as they've had an "amazing and awesome" engagement at The Kennedy Center and opening for acts like Lyle Lovett, Ricky Scaggs and Kris Kristofferson. For Tony, as far as mentors are concerned, "I feel Peter Gabriel is God." Come to the Outer Space on October 8 and experience an evening of great vibrations with Tony and Grace and Dom Flemons.